Learn your backyard birds. No, not another onerous duty. Your birds will add joy to your life. 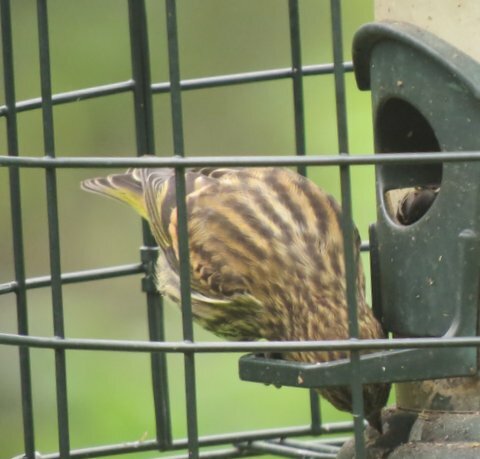 You probably already recognize the birds at your feeder. To get to know them really well, look intently at them for a few minutes each day. The side view, the one portrayed in your bird guide, is probably familiar. Look, too, when the bird faces you. Stare at its back. Gradually, you’ll distinguish not only the colors and plumage pattern, but also the size and the shape of each species. All those details make up the bird’s uniqueness. Each time we can identify a bird, we experience a pleasant spark of pleasure. After all, the name is the beginning of familiarity. Next, we see the bird behaving in its unique way. We find ourselves thinking about it and even talking about it. We might remark, “The jays are bullies. All the other birds are intimidated.” Observing them, we feel more connected to the birds’ world. 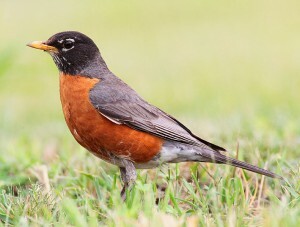 An Americn Robin always looks around for predators before probing for worms. Wikimedia photo. Don’t just watch through your windows. Go outside. American Robin, Gray Catbird, Northern Mockingbird aren’t interested in your feeders. These and other common backyard birds eat insects and berries. Get to know them, too. How well do you know a robin? Of course, you know it by its “red” breast, but sometimes you get only a partial view. What color is its bill? The legs? Have you noticed the dark tail with white corner tips? Do you know male and female robins are different? Try recognizing robins flying overhead. The flight is direct, but the wingbeats are uneven, rather erratic. The white of the lower belly and undertail coverts is usually visible. Then notice how it lands on the ground. With its head held high and bill angled up, a robin looks purposeful, even haughty. Next it tips down to probe for worms. I could go on with my impressions. And, so could you. During the winter we may find only 15 or so species. Even then, something unusual could show up—a Baltimore Oriole visited me one December 25th. In spring or fall we’ll probably see 25 species of birds, perhaps even more during a fall cold front or spring warm front. Some of the migrants may linger for a day or more in your yard. After all, yours is likely the best habitat in the neighborhood—undoubtedly so, if you’ve been growing native plants for a few years. Aren’t the nearby properties with their grass and non-native plants an impoverished landscape? We don’t always get the best view. 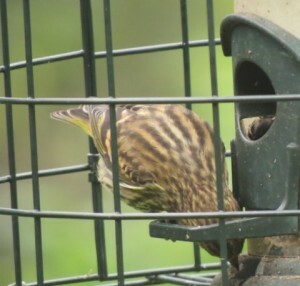 It’s a Pine Siskin, the same size and shape as American Goldfinch, but streaky. Photo © Edie Parnum. Click to enlarge. Occasionally something “really good” will show up. Yes, a special bird like a Blackburnian Warbler could stop and feed in the native trees your yard. (Look it up. This spectacular bird breeds in the northern forests.) Oaks, especially, will attract additional eye-catching warblers, among them American Redstart, Black and White Warbler, Chestnut-sided Warbler, Black-throated Blue Warbler, and Black-throated Green Warbler—yes, these and many others have come to my yard. So, too, have Pileated Woodpecker, Cedar Waxwing, Yellow-bellied Sapsucker, Red-breasted Nuthatch, Pine Siskin, and so on. With each I wondered where it’s been and where it’s going. I look it up. Each new bird enlarges my understanding of the natural world. 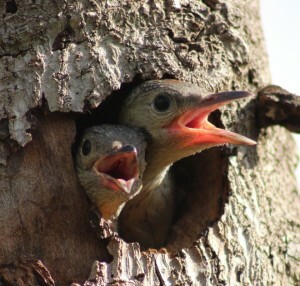 Two Red-bellied Woodpeckers waiting to be fed. Photo © Holly Barrett 2015. Click to enlarge. singing to attract a mate and defend his territory. Sometimes we’ll see birds building their nests. 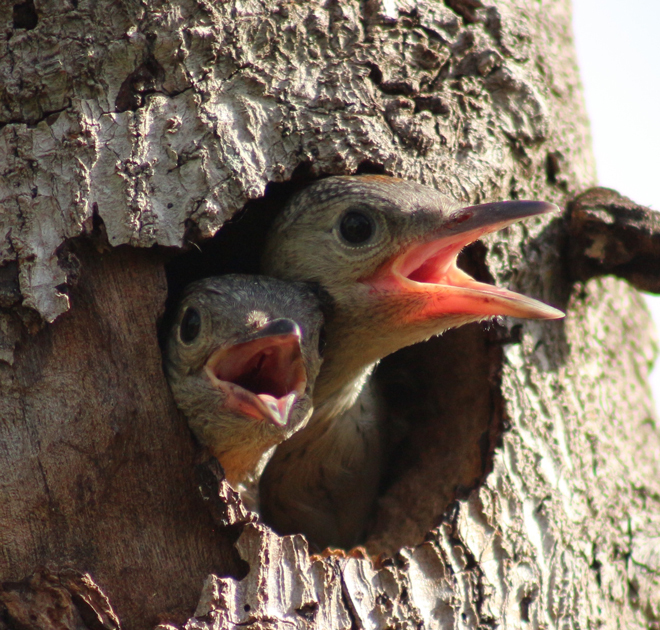 For instance, I watched a pair of Red-bellied Woodpeckers excavate a nest hole and then bring insects to the nestlings. At first the baby birds remained deep inside the nest hole peeping quietly. Later the ravenous youngsters appeared at the nest opening begging loudly. If we’re observant, we can observe other birds feed their nestlings. I’ve watched House Wrens bring caterpillars and other insects to their young 30 times an hour. They work consistently from dawn to dusk. That’s hard work, and they have to feed themselves, too. We are lucky, our birds carry on their activities of daily life right in our yard. Look overhead, too. Watch and learn your birds in flight. Smaller birds fly faster, bigger birds are slower. Think crow (slow, but powerful) versus chickadee (quick and bouncy). You’ll recognize the swift, direct flight of a Cooper’s Hawk coming in for a kill. 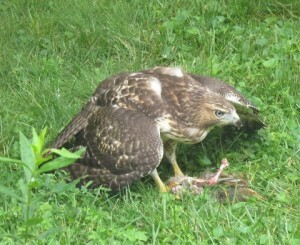 A Red-tailed Hawk eating its prey, a backyard squirrel. Photo © Edie Parnum. Click to enlarge. meal, it scans the entire yard for any unwary bird. Alert to its presence, most birds have escaped into the thick shrubbery. Perhaps a Blue Jay sounded the alarm. The other less vigilant birds sit exposed but perfectly still, terrified of being spotted. True, I like living birds more than dead ones. However, in defense of hawks, I know that starvation, severe weather, and disease kill more birds. Hawks are not “bad”. Nature is amoral; death and killing play a healthy role. Unsentimentally, I appreciate hawks for their contribution to the web of life.